Tiger, Tiger, On the shore” begins the book. 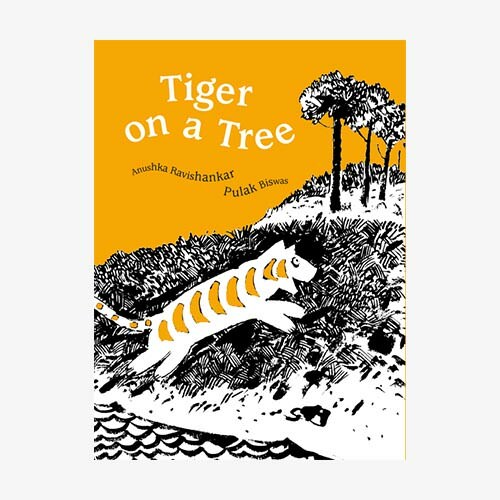 From the beloved children’s book author Anushka Ravishankar, comes this rhyming little story of a tiger who crosses the river and gets scared of a goat and climbs a tree. The humans then trap him and wonder what to do with him? “He’s caught. He’s got. Now what?” they say. They then vote unanimously to release him and the book circles back to “Tiger, Tiger, On the shore”. The illustrations by Pulak Biswas in black, white and orange have a earthy quality to it, in the same style as Catch That Crocodile, another favorite with us.